Gopadevi/Krishna tells Baldevi/Balram it is time for Seshnag and Narayn to act and end adharma. They walk towards dacoits. Dacoits warn to come in front, else they will harm Radha and her friends. They both walk in front. Dacoits laugh that these helpless women cannot harm her. Gopadevi/Krishna shouts that they should take them also along as they looted their employer’s house and they are jobless now. Dacoit warns to stop acting smart and walks towards Gopadevi. Baldevi holds dacoit’s hand. Dacoit tries hard to free himself and calls his team. Gopadevi runs holding Radha’s hand followed by Gopis. She asks Baldevi to show her power. Baldevi says why not, Seshnag is awake after a long time. Dacoits surround Baldevi and laugh that she is helpless woman and daring to provoke men. Baldevi says men fight instead of talking. They attack her and she easily trashes them down. Gopadevi/Krishna runs holding Radha’s hand reminiscing their previous running incidents. Once they are away from dacoits, she says now they are safe and let us return home. Two dacoits emerge and walk towards them. Gopadevi/Krishna warns them to back off, else she will not spare them. One dacoit walks towards them. 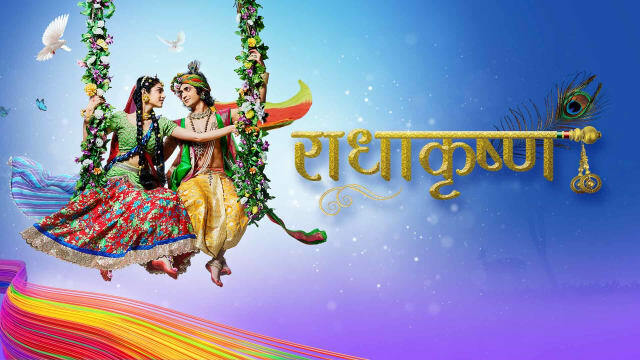 Gopadevi/Krishna pushes wooden log towards him and he falls down on stone and collapses. Another walks towards them, and she picks sword and warns to back off. Gopadevi/Krishna pushes him into water and says Radha let us go home now as Vrishbhan uncle will be worried. Radha watches her carefully. Gopis return and asks Radha if she is fine. Radha continues looking at Gopadevi/Krishna. Gopadevi/Krishna gets more tensed and says let us go as Vrisbhan kaka must be worried. Radha agrees and walks with her, but stops saying Baldevi needs their help. Gopadevi/Krishna says Baldevi is safe. Radha says how can she say and tells friends let us go to help Baldevi. They all walk with her. Krishna thinks his Radha is fearless now. They reach Baldevi and see her standing munching carrot. Gopadevi/Krishna says Baldevi is very powerful since childhood, so she is named Baldevi, she just knows to trash people and eat. Baldevi nods yes. Radha looks at them and they get tensed. Vrishbhan and Kirtida sit tensed worried for Radha and her friends. Ayan and Vyomesh says they will go and bring Radha and friends back. Jatila says Ayan is a warrior and it is his duty to fight with dacoits and bring them back. Gopadevi walks with Radha and others and says there is no need for that. Vrishbhan and Kirtida get happy and ask how did they return. Radha says Gopadevi and Baldevi saved them with their bravery. Jatila fumes that these foolish girls spoilt her plan. Vrishbhan thanks Gopadevi/Krishna and Baldevi and says from hereon they are like her daughters. He asks guards to tighten Barsana’s security. Gopadevi/Krishna says there is no need for that as culprit is insider who opened main door from inside. Guards say someone hit them from inside and they could not see his face. Gopadevi/Krishna says it is a serious concern, who must be the traitor. Vrishbhan says she is right, they should find out culprit. Krishna gives moral gyaan that diamond becomes tough after years of being underground and would be like coal underground, but when it is cut into shape, it gets precious; similarly one has to go through many hardship to become competent and valuable. Gopadevi tells they have to make sure outsider has not entered among them. Radha says Gopadevi and Baldevi came and problems started after they came here.